Hello fellow classic enthusiasts and welcome to The Lost Generation Tour held by The Classics Circuit. As soon as I received word of this tour I immediately knew which book I wanted to spotlight. It was a re-read for me but one of those books that I remember distinctly down to exactly when and where I was when I first devoured it and how long it took me to complete it (approximately a week). On my second reading I took my time and simply enjoyed the nuances and details I might have not have appreciated both as a reader at a younger age and as a first time reader of the book who simply could not get enough of it as fast as possible. 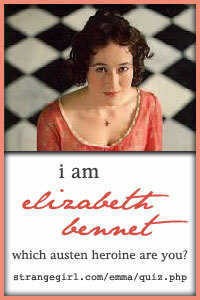 The book is one of many on ALA’s List of Banned and Challenged Classics. It is the story of one young man and his insatiable thirst for social advancement and what some may consider the “rags to riches” American dream. 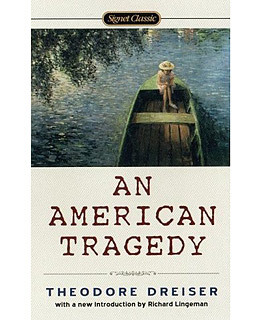 The novel is the 1925 classic An American Tragedy by Theodore Dreiser. This work has been called “the worst-written great novel in the world” while others consider it one of the greatest American novels of any time period. The novel is considered a work of naturalism: a literary style that explores the premise that individuals’ fates are determined by a combination of hereditary and environmental constraints that leave no room for free will or true individual choice. For that reason our main character Clyde Griffiths is considered to be somewhat of an anti-hero. We begin in Clyde’s childhood on the city streets as part of a family missionary group barely surviving and shunning the world of material possessions and even the stability of modern education for a sidewalk sideshow religious lifestyle. Clyde even as a child rejects this lifestyle, seeing his parents as fools and longing for more. He wishes for everything he sees around him but beyond his grasp, he wishes for power, wealth, to be accepted, to be someone. He wants the American dream and is determined to do anything to get it….no matter the consequences. The novel continues to follow Clyde through various jobs, shenanigans and lapses in moral judgement until a defining moment when Clyde does the unthinkable for the sake of his ambition. Is Clyde a bad human being or a product of his upbringing and the greed of American society at this time in history? Only you as the reader can truly make that judgement after completing the book but many readers have differing opinions or believe a little of both. While I don’t want to spoil the book for readers who know nothing of the central premise or ending, I will say that Dreiser based the book on a very sensational murder case involving a young man named Chester Gilette who in 1906 murdered his pregnant girlfriend and later paid the ultimate price: his life. In the case of An American Tragedy it’s not necessarily the writing that excels…more the truth of the story. The novel works and flows in a way that readers are carried along almost magically despite it’s rather long length. It is a true classic and a testament to the question of whether we choose our own fate…or it is chosen for us by the life we are given to live. Does it take a truly horrible person to commit a crime or are some people pushed to limits that they cannot handle due to their upbringing or what society has led them to believe is most important in life. In the end An American Tragedy gives readers an engrossing story and a debate to settle within themselves. It’s a classic often forgot but not to be missed. Please remember to also check out The Classics Circuit’s other “Lost Generation” tour stops to find other great classics just waiting to be read. 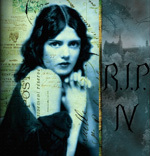 I am excited to have finished my reading for Stainless Steel Droppings’ R.I.P IV Challenge. I am posting early just because I rarely have time lately to post and with my son’s first Halloween coming up I am busy with Mommy stuff and may not get in anymore spooky reading! I must say I was happy with what I accomplished this last month though reading wise. I really have gotten hooked on Charlaine Harris and her Sookie Stackhouse series and I found a very similar series I like by Molly Harper. The first two books are out now: Nice Girls Don’t Have Fangs and Nice Girls Don’t Date Dead Men. Nice Girls Don’t Live Forever will be released January 2010. Now normally these books would not be “my cup of tea” but the main character is a Children’s Librarian, dedicated Janeite and frankly hilarious! So my final total was 10 although I did not get to every genre. I really wanted to re-read some Poe and The Monk but time ran away! Happy Halloween! !